I am back for more nail art designs after a very long hiatus. To start things off after a frustrating few weeks, I decided to create something simple, something easy to do. I painted small flowers in random places on all my nails with hope that this would bring some cheer to my gloomy mood. I named this Scattered Flowers simply because they are. I have always believed that flowers are classy when it comes to nail art designs and you don't need to paint them with lots of details to create something beautiful. For background color, I chose China Glaze Kinetic Candy in 2 coats. I had no problems with the application, no streak marks to worry while doing so. Kinetic Candy is a recent purchase from Digital Traincase and I have been meaning to use it since I got it barely 2 weeks ago. This is a perfect base color for spring or summer. I can see myself using this for more nail designs in the future. I hand painted the flowers on my nails using acrylic paint and a detailing nail art brush. They are small 5-petal flowers in pink, a color that I think would really pop on our background color. I also added a few white dots to fill in awkward places around each nail. If you have been following this nail art blog for some time now, you'll probably notice my preference to add tiny dots as details to my nail designs. I really think it gives the nail art a little extra. 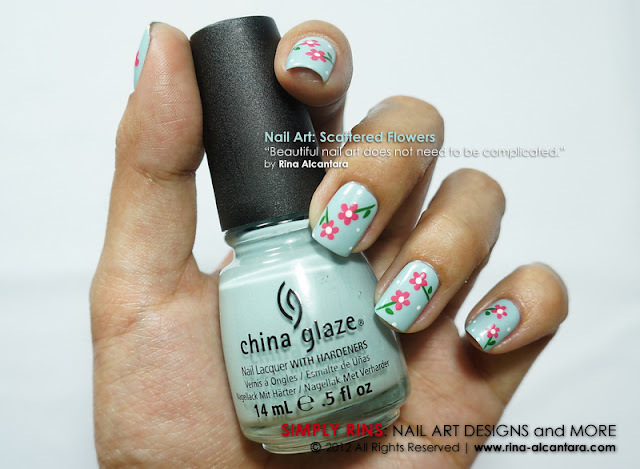 If you are a nail art beginner and would love to try some freehand design, I would recommend you try this. It is simple enough to paint on both your hands. So pretty! I love the colors you chose. I like adding dots to designs as well. It's a simple way to fill in some empty spaces that just seem like they need something. Oh my! those are perfect and soo cute! Your nail art is always so clean! This almost looks like decals. What a happy, spring look. Oh that is exciting! I hope it works out for you! And this design is lovely in its simplicity. You can always make things beautiful! I love that you said that Kinetic Candy begs for nail art. :P I absolutely think so too! Your website has inspired me to try a new design on my nails every week. I just discovered how much fun it is to paint nail art. I have no long acrilic nails but now I know that I can make them look pretty. Thanks!